Includes YC500 Microinverter, End Cap and AC power lead. The APS Microinverter marks a new generation of solar technology, making your solar array more powerful, economical, dependable, intelligent and safe. Economical: The YC500 is designed to handle two solar modules while still maximizing each unit's power through dual MPPTs. This reduces the number of units required for installation helping to reduce labour costs. Dependable: All APS products undergo rigorous factory testing and evaluation resulting in the highest-quality solar solution that matches the lifetime of your solar modules. They come with a 25-year limited warranty as standard. Intelligent: APS also have a high-tech data collection and communication program to provide end-users with real-time performance and efficiency information. Installers can also build up a monitoring portfolio and use this to demo for prospective customers. An installer tool app is available on Android and iOS for a quick and easy guide when on a roof. Update: APS have now released their EMA APP available for smartphones and tablets for easy access wherever your customer is. You may also need two rail bolts to fix the inverter onto the rail and an ECU to monitor the system. 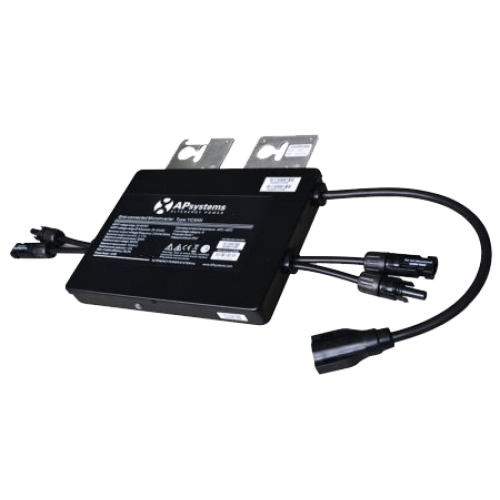 The APS micro-inverters work without the monitor, making them a perfect option for budget or small kits. You can still install an odd number of panels using the APS by putting caps over the un-used connectors.